If your toilet is not operating efficiently, it can cause major problems. These problems can range anywhere from an increased water bill, to causing a hazardous situation that could require a lengthy, expensive repair process if not addressed soon. Anyone experiencing serious problems with their toilet should call the experts at Universal Plumbing and Sewer right away. The experience and performance that comes along with employing a professional plumber can prove to be invaluable later on when your toilet is running cleanly and efficiently, as opposed to running up your monthly bill or completely quitting on you. Don’t go into this situation blindly. While we recommend hiring a professional to repair the issue, make sure you know what to look for in a toilet repair specialist. Any plumber can claim to have the necessary knowledge to do the job at a high level. It is an entirely different thing to actually have a track record which proves the highest level of knowledge when it comes to toilet installation and repair.. Make sure to research the credentials of your plumber. Don’t forget to talk to them a bit before hiring them, just to make sure that they’re bringing enough knowledge and experience to the table to earn your trust. This is always the #1 priority for any legitimate professional. Plumbing can be a dangerous job, and can negatively affect everyone living in the home when completed poorly. There is especially no exception for dealing with toilets. If improperly handled, your toilet’s inefficiency could lead to burst pipes, backed up sewer lines, and even increased toxicity in the area. Of course, most of those situations are only results of cases of extreme neglect, but you can never be too careful with the plumber you choose. Make sure you choose a plumbing company with a reputation for safety. One of the most annoying things that inexperienced plumbers will do is cause a large amount of damage to the area surrounding their work and not having the resources to clean up the mess. Furthermore, many inexperienced toilet repairmen will inadvertently fix the initial problem, but cause the toilet to waste more water in the process. Finding an experienced plumber who is sure to not only do the right job, but to do it efficiently, is the best possible investment you can make during this process. If you are looking to replace an existing toilet, please consider the questions listed below. After you have decided on the type of toilet you are looking for or if you would like further information, please contact our office at (586) 459-0040 for pricing and to schedule an appointment. 1. Round front or elongated? Is there a space restriction where the toilet will be installed? Round front toilets are compact to fit in small spaces and are less expensive than elongated bowl models. Elongated toilets feature extended rim length, especially designed for comfortable use by adults. 2. Would you prefer one-piece, or two? A "one-piece" toilet is a seamless, space-saving unit. It is a smooth toilet without coves and crevices that allow dirt waste and odors to collect. Two-piece toilets are the traditional design. They are a separate tank and bowl which are bolted together during installation. 3. Gravity-fed or pressure-assisted flush? There are two basic types of toilet flushing systems; both types save water by using 1.6 gallons of water per flush. 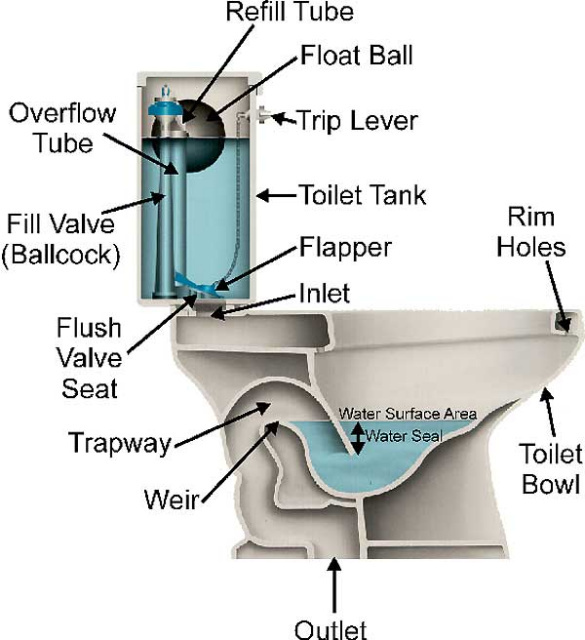 Gravity-fed flush toilets use the force of gravity and a siphon "pull-through" action to empty the bowl. Look for gravity-fed toilets offering high performance to efficiently and quietly dispose waste. Pressure-assisted toilets harness pressure from the water supply in the home to create a powerful "push-through" flush. All waste is removed quickly in about four seconds. Pressure assisted toilets are slightly louder and there is no condensation or "sweating" on the outer tank. We recommend toilets with a deep, rich, even coat of glaze that will allow it to be easily cleaned. Ideally, the internal trap way should be glazed, providing a smooth surface to facilitate the flow of waste and prevent clogging. Using a superior quality toilet will allow for lasting durability and performance. Toilets come in varying sizes, so check the width, depth and height of your available space. Also, most toilets bolt to the floor 12" from the wall, but some toilet manufacturers also make 10" and 14" models. Measure first before ordering, and if you are uncertain, have one of our technicians come out and measure for you.